You can't have an effective web app without a database. Read on to learn how to hook one up to the React application we're building. 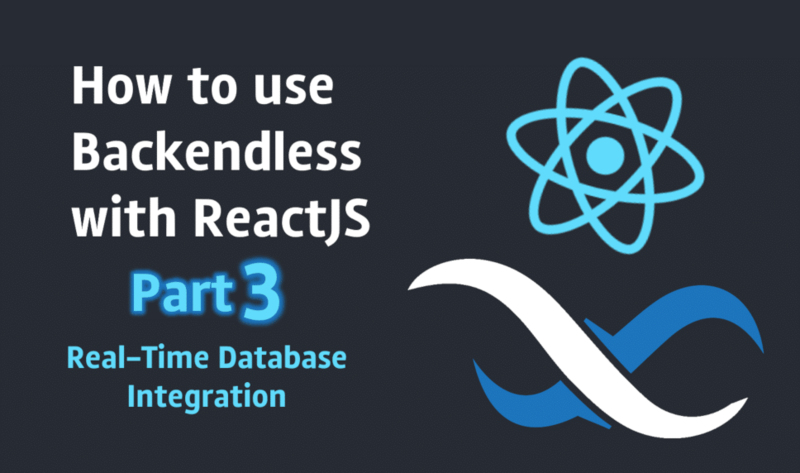 This is the third part of our series on using Backendless with a React.js frontend app. You can catch up on the previous articles here: Part 1 and Part 2. If you'd like to jump in now, you can simply create a new Backendless app, clone our previous progress from our repository, and use this commit as an entry point for today's article. Our goal for today is to showcase integration with our Real-Time (we call it RT) database for delivering changes in your data table from the server to the client. We have previously written about implementation of RT in an Angular app ( "How to Use the Backendless Real-Time Database in Your Angular App"). If you're interested in Angular or you just want to see difference between the usage of RT with React and Angular, we'd recommend you give that article a read. What Is Real-Time (RT) Database? create - this event is delivered to the client app when a new object is created on the server. update - this event is delivered to the client app when an existing object is changed on the server. delete - this event is delivered to the client app when an existing object is deleted on the server. All of our SDKs (JS, Android, and iOS) have been updated with the logic necessary to establish a connection to our Real-Time servers and provide you with the ability to subscribe to the events shown above. Check out the Real-Time Database API documentation for more information. Listener for create record in the database. Listener for update record in the database. Listener for delete record in the database. Also, there are may be a case when we need to listen for only one kind of change. For example, let's say we have a Message table and we know that there is no way to remove or update records on the server. Therefore, we only need to subscribe for create objects. As another example, say we have a table and we would only like to receive changes to current users. In this case, we need only the subscription for the update object. In our app, we will use all of the subscription types in order to keep our Persons collection up-to-date. Don't forget to add action types for these actions. Reducer action t.CREATE_PERSON_SUCCESS will put the new created person into the store. RT action t.ON_PERSON_CREATE will put the new created person into the store as well. Surprisingly easy, wasn't it? We just used a very basic case, but there are many cases where RT could be vital. If you have any questions or are looking for a specific solution with RT, please leave us a comment or create a new support topic on our support forum. Thanks for reading! Everything we have done today can be found in this commit.